Is there enough opportunity in sports betting and Japan to make up the difference? The lights are dimming in Las Vegas and Macau. As a result, casino operators across the world -- from the more U.S.-focused operators like Caesars (NASDAQ:CZR) and MGM Resorts (NYSE:MGM) to those with a greater international presence like Las Vegas Sands (NYSE:LVS), Melco (NASDAQ:MLCO), and Wynn (NASDAQ:WYNN) -- are searching for a winning formula in other markets. And despite the allure of new opportunities like sports betting and the development of Japan's integrated resorts, there's a good chance gaming company performance will decline going forward. Caesars' revised outlook for its Las Vegas resorts caused its stock to lose a quarter of its value when the company forecast slowing demand in July and August. MGM also missed analysts' expectations for the quarter and said it was cutting its hotel room rates to attract more guests. MGM owns close to half the casinos on the Las Vegas Strip. In China, things are slightly better, but growth is slowing. Although Macau posted its 24th consecutive month of higher gaming revenues, which were up 10% in July, the figure was down 3.6% from the start of the year. Melco missed Wall Street forecasts for top and bottom-line growth, while Sands' performance in Macau over the first six months lagged the region overall. And Wynn saw its newer Palace resort continue to cannibalize revenue from the more mature Wynn Macau, an effect also apparent at MGM's two Macau resorts. 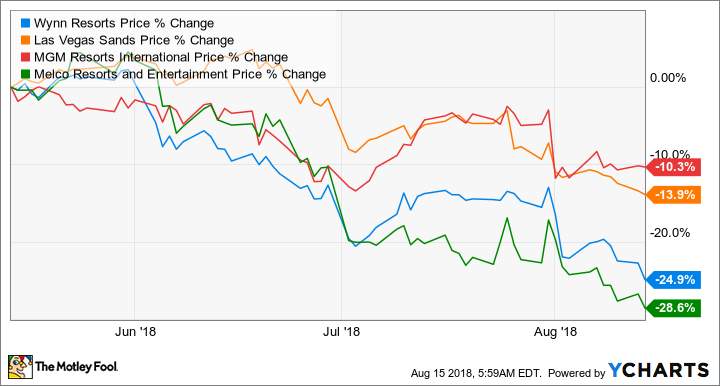 Shares of the casino operators have all fallen by double-digits over the past three months as it becomes clear that the world's two biggest gaming markets have obstacles to overcome. The first potential source of relief lies in sports betting, which went live in a few states in June with more coming on line in the near future. So far, the handle (or total amount bet) in Delaware is over $15 million with the casinos and racetracks generating about $1.5 million in revenue. New Jersey had a two-month handle of over $57 million with revenue of $7.3 million. Those are the only two states where sports betting had begun, outside of Nevada where it's been legal for decades. Meanwhile, Mississippi began accepting wagers on Aug. 1, and a number of states, including New York, Pennsylvania, and Rhode Island have passed laws legalizing sports betting, but wagering has not yet begun. Some 18 states are expected to tackle the issue over the next year or so. MGM seems to be trying to corner this market after making acquisitions in what are sure to be prime markets, including the New York metropolitan area, and partnering with other casino operators to expand its reach. MGM has joined forces with Boyd Gaming to cross-pollinate their respective casinos with sports betting, and it signed a licensing deal with the National Basketball Association to be the league's official sports betting sponsor. Yet other casinos plan to roll out their own sportsbooks, too. Caesars Entertainment started with its Atlantic City Bally's casino in June and Harrah's earlier this month, along with two other casinos in Mississippi. Most casinos in that state are expected to begin accepting sports wagers by the start of football season in September. Meanwhile, Japan remains an enticing but uncertain opportunity -- analysts estimate the region could quickly become the world's second largest gambling market. However, Japan's legislature is limiting the number of operating licenses to just three, which means the winners will not only be on the leading edge of a brand new market but all while enjoying a virtual monopoly over casino gaming in the region. That explains why most casino operators have expressed a willingness to spend as much as $10 billion constructing integrated resorts in Japan. Partnering with local companies is sure to be a hallmark of the casinos' attempts to woo Japanese regulators, while players like Melco Resorts will highlight their roots in the region. Yet the legislature hasn't even named the cities that will get permission to host casinos, and it won't be until the mid-2020s at the earliest before any casinos actually opens their doors for business. Investors need to look at how casinos will fare in their existing markets for the time being. Companies like Las Vegas Sands and Wynn Resorts are vulnerable to another Chinese government crackdown on gaming, and changes to the regulatory environment in Macau are suspected of driving the current reduction of demand among VIPs in a region that is still heavily reliant upon them. Because Caesars Entertainment generates almost half its revenue from Las Vegas, it's similarly dependent on the city's health. But it also has other properties around the U.S. that account for almost an equal amount of revenue, which could buffer any shortfall. MGM Resorts, with its concentration in Las Vegas and a presence in Macau, is likely to come out on top since it also has resorts in a number of states across the country (its Springfield, Massachusetts, property is scheduled to come on line soon). With sports betting serving as a potential bridge that many of these casinos can use to bypass the coming contraction, MGM could be the best bet.